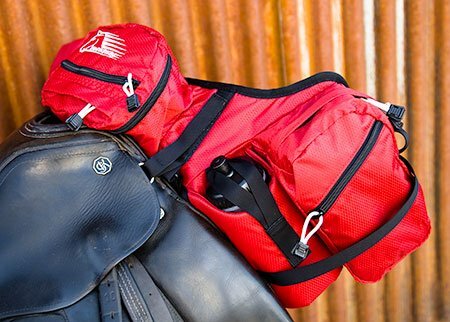 The Stowaway saddle packs from Easycare Inc. feature a no bounce design, water resistant material, reinforced bound seams and extended zipper tabs. Colors Navy Royal Blue Hunter Green Purple Brown Black in drop down list. Out of stock colors will not show in list. Contact me to see when they are expected in. The ROYAL BLUE is now a bit darker. Deluxe Pommel Fits both Western and English style saddles. Comes with two 20 oz. water bottles. The Stowaway line by Easycare, Inc is the most advanced innovation in "no-bounce" saddle pack design. 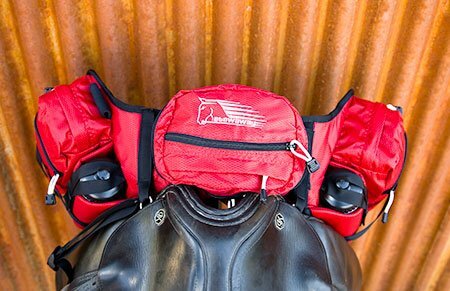 Maximum storage with minimum bulk, these packs will work for many riding styles. Multiple straps and rings allow attachment for most types of saddles. Several compartments allow for better organization and quick, easy access to what you need when you need it. Superior fabric and heavy-duty adjustment systems make these packs the most durable, user-friendly pack you'll ever own. � 420D Ripstop material with waterproof urethane backing. � Foam-padded bottom panel lined with durable, soft, short-pile fleece to protect your saddle and your horse from the weight of the pack's contents. � Extended nylon-tabbed zipper pulls for easy access to all compartments. � All outer seams are reinforced with durable binding. If you don't see the color you need in the drop down list it is temporarily out of stock. email for estimated arrival date. Photos courtesy of EasyCare inc.
Stowaway Deluxe Pommel saddle pack bag Photos courtesy of Easycare Inc.